Given the escalation of violent conflict, nuclear threat, and lawlessness across our shared globe today, there has never been greater urgency or a better window of opportunity to promote the Canadian Peace Initiative. 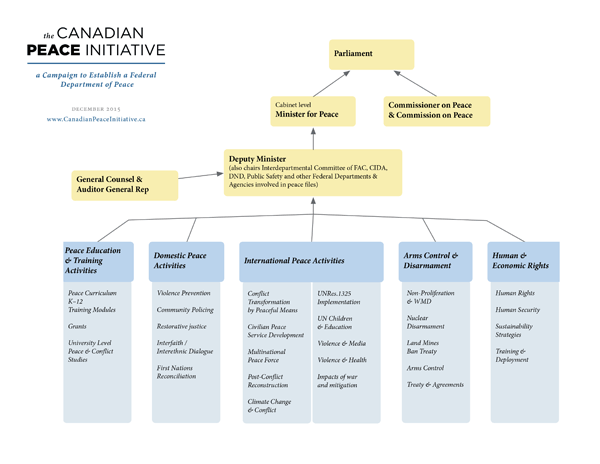 The Canadian Peace Initiative (CPI) is committed to the establishment of a Department of Peace within the Government of Canada. The Department of Peace would work towards building a new architecture of peace by establishing and supporting a culture of peace and assertive non-violence in Canada and the world. We are part of a growing international movement that includes citizens from some 50 countries represented in the Global Alliance for Ministries & Infrastructures of Peace. Four governments have already established Ministers of Peace: the Solomon Islands (2005), Nepal (2007), Costa Rica (2009), and most recently the Autonomous Region of Bougainville, Papua New Guinea. Our Initiative has chapters and contacts across Canada and is endorsed by more than 30 national organizations and eminent individuals. Supporters of the CPI include such prominent Canadians as the Honourable Lloyd Axworthy and Senators Doug Roche and Dr. Anne Pearson. The CPI is also supported by several organizations that together represent 2 million Canadians, such as the Council of Canadians, the World Federalist Movement ? Canada, and Physicians for Global Survival. Our strategy is to use Bill C-373, An Act to Establish the Department of Peace, as a road map and build a groundswell of support among the Canadian people, to make the idea compelling to politicians. Develop early detection and rapid response processes to deal with emerging conflicts and establish systemic responses to post-conflict demobilization, reconciliation, and reconstruction. Lead internationally to abolish nuclear, biological, and chemical weapons; to reduce conventional weapon arsenals; and to ban the weaponization of space. Implement UN Resolution 1325 to protect and support the key role played by women in the wide spectrum of peace-building work. Establish a Civilian Peace Service that, with other training organizations, will recruit, train, and accredit peace professionals and volunteers to work at home and abroad, as an alternative to armed intervention. Address issues of violence in Canada by promoting non-violent approaches that encourage community involvement and responsibility, such as Restorative Justice, Non-violent Communication, and Alternate Dispute Resolution. Establish processes of reconciliation with Canada's indigenous peoples. Download the proposed Department of Peace Model (PDF). Living free from the threat of armed violence is a basic human need. It is a precondition for human development, dignity and well-being. Providing for the human security of their citizens is a core responsibility of governments.